It has being said the heart of the matter is often the matter of the heart, and the best way to get to the matter of the heart is to ask the “why” question. It is important that we answer the “why” question first, before we consider the “what” and “how” questions, because the “what” and “how” questions relate more to the mind. Conventional wisdom tells us that the heart must first be convicted, before the mind can be aligned, so that the action can be consistent. In the same vein, the Tai Chi for Health Institute (TCHI) need also to ask the question “why do we exist” before we ask “what must we do and how can we grow”. This is a question of our purpose and vision. In this regard, I believe we have an excellent answer. The purpose of TCHI is to empower people to improve their health and wellness and the vision is making Tai Chi for Health accessible to everyone for health and wellness. 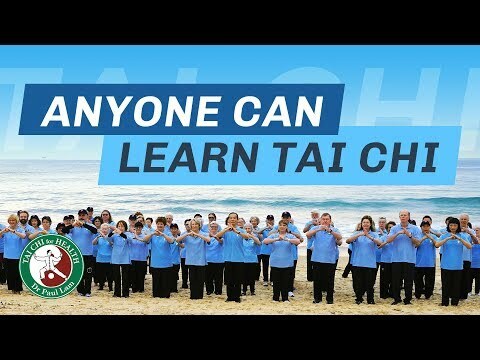 This is a very laudable purpose and vision indeed, for all of us in TCHI have a common passion to see Tai Chi for health being promoted to all people, so that they can benefit in health and wellness. 6. Spiritual- appreciating life, having valuesIndeed, a person can only be truly well if all six dimensions of health and wellness are healthy. The keys to unlock this tremendous potential lie in our purpose and vision as well: to empower people to improve health and wellness by making Tai Chi for Health accessible for everyone. How then can we empower people and make Tai Chi for Health accessible for all? As much as the magic of Tai Chi lies in the Tai Chi principles, I believe the magic of the growth of Tai Chi for Health (TCH) program will depend on the Tai Chi principles as well. Tai Chi movement should be slow, continuous and smooth. In addition, the movement should also be against gentle resistance. Translated into growing the TCH program, our efforts should be slow, continuous and smooth. In change management of a complex adaptive system, speed in execution may not always be helpful. Oftentimes, slow deliberate actions are more helpful than fast but meaningless activities. Persistence and perseverance are also required in order for our efforts to be continuous. We must not be afraid to fail and try again, to fail and try yet again, learning from our mistakes as we press on to our purpose and vision.Our actions should also be smooth, sensitive to the culture and context of the situations that we are operating in. Gentle resistance can be translated into constructive conflict, a necessary ingredient for an organization that is eager to learn from one another, and to maximize the engagement and potential of each and every individual member. In Tai Chi, the posture should be upright and the weight transfer should be deliberate, and balance, when moving forward or backward. Translated into growing the TCH program, we ought to be upright in our character and values, and also demonstrate empathy in our relationship building. Be careful to listen to one another before we give appropriate comments or advices. Be sensitive to the emotional transference in our communications and dealings, so that we can keep it positive to build up one another. The third category of Tai Chi principles refers to the “internal”, that of “Jing” and “Song”. Simply translated, “Jing” means to “remain focus in the practice of Tai Chi“ and “Song” means to “open up the joints”. “Jing” can be translated into mindfulness, the purposeful intentional self-awareness that allows us to observe our own perceptions, thoughts, feelings and actions on a moment-to-moment basis, and to understand the internal and external factors contributing our own reactions. “Song” can be translated into openness in our minds and hearts, so that we can accept what is not our own, see the positive in everyone and every situation, so that we can build on the positive in every circumstance. Practicing Tai Chi by observing the principles will help cultivate and flow the “chi” (energy) and focus the “yi” (intention). In the same manner, nurturing and growing the TCH program by observing the principles will help cultivate and flow the “trust” and “align” our purpose and vision. Trust and alignment are the two most important factors in our success as an organization. In the Yin and Yang of change management, we should also observe the need for receiving and perceiving (Yin) versus giving and doing (Yang), the need for quiet consolidation (Yin) versus energetic change (Yang), and the need for mutual nurturing of both Yin and Yang for holistic growth. If we compromise the Yin, then the Yang may look strong for a little while, but it will also decline eventually without the nourishment of the Yin. The net result is a diminishing of the sum total of Yin and Yang. A better way is to build up the Yin, so that the Yang can be nourished and grow as well, then the sum total of both Yin and Yang will be greater than before. The TCHI is like the Yin of the TCH movement. In the area of training and education, she can develop curriculum and pedagogy of TCH program and better tools for trainers to teach better. In the area of research, TCHI can collate medical studies that are evidence based, to show the improvement of health and wellness outcomes of the TCH program. She can also develop research protocol and teach research methodology to our members who are keen to do research. In the area of promotion and resource, TCHI can develop marketing strategies and business plans to convince funders of the cost effectiveness of our TCH program, and also help with accreditation of instructors and master trainers. The various TCH communities all over the world is like the Yang of the TCH movement. In the area of training and education, they can attend the workshops, provide feedback to improve the program and use the teaching tools. In the area of research, they can participate in the health and wellness outcome based research as they teach and practice TCH. In the area of promotion and resource, the communities can engage government agencies and community groups, for organization of TCH programs. They can also encourage the various health professionals and volunteer groups for TCH instructor accreditation. In order to sustain the growth of the TCH movement, we also need the “Dan Tian”, the space or hub where the “chi” or “trust” can originate, gather and flow strongly. This can be the annual TCH workshop in the various regions of the world, as well as the local TCH communities’ activities. We can also explore the use of social media such as private facebook groups to promote interaction between members. If we can nurture TCH institute and TCH communities all over the world by relating to one another based on the Tai Chi principles for growth, I am certain that in the not too distant future, we may be able to realise a common dream: “to empower people to improve health and wellness by making Tai Chi for Health accessible for everyone.” We can do it! Dr Lam’s Tai Chi for Health Institute has established a comprehensive curriculum that includes knowledge of tai chi and chronic conditions, effective teaching methods and how to stay safe.